It may be something of an understatement to say that Mercedes have a wave of new cars coming on stream over the next few years. The fact of the matter, is they have, judging by the numbers they’re talking about. This week they unveiled two: The fourth generation A-Class and the third-generation CLS four-door, five-seater coupe. The all-new cars are major advances on what has gone before. But imagine this: There will be 18 new first-generation Mercs (no direct antecedents, no current counterparts) on the go by 2025. Given the breadth of their current line-up (and future versions of the cars), that is an extraordinary number of totally new models to be added to a range. Many of them, including 10 electrics (EQ) will be on sale well before then. The electric EQC will be out next year, the EQA in 2020. Both have 420km ranges under the new WLTP emissions/fuel-consumption system. By 2025, between 15pc and 25pc of Mercedes’ production will be EQ-oriented. Those figures give an idea of how quickly times are changing, but they still show EVs in the minority even by 2025. For now, Mercedes is focusing on battling for buyers of new diesel and petrol-engined models. In doing so, they are rolling back the years on the age of ownership, with the A-Class in particular. They reckon average age is now 35 – a drop of 13 years on a couple of generations ago. I previously reported on my First Drive abroad in the A-Class, so I’ll not bore you further except to highlight a few key points. The car looks much better, longer, smarter and is roomier. My brief drive here confirmed impressions of better handling and ride. There’s a big, big improvement inside too, with twin screens and ventilation outlets providing a wonderful aspect. The steering wheel is straight from S-Class, but there’s new tech in the smaller car that will work itself up to big brothers too. Most notable will be the standard new MBUX infotainment system – all cars have high-res double screens – which learns from what you tell it. Just say ‘Hey Mercedes’ and the ‘lady’ asks what function you want. It works. And apparently it learns. Watch out too for the augmented reality feature. It imposes the name of streets and road imagery onto the screen. Brilliant. Here now is the A180d automatic (1.5-diesel), starting at €31,600, and the A200 petrol (1.3-litre), starting at €34,235. There are three design lines: Style, Progressive and AMG Line. The most popular models will be the A160 petrol and A160 diesel. Both are due in the autumn, costing around €30,000. 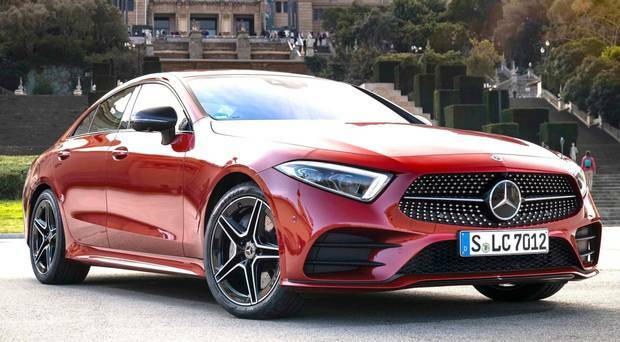 An A-Class saloon is due in February. They claim they’re putting in spec that costs a lot more than the increase in the price of the car. That goes for the CLS too. The big, roomy car has 6cyl in-line engines as well as a 4cyl from the E-Class. The 300d auto (245bhp) with €280 road tax will be the big seller (90pc). There will be a CLS 220d early next year. Prices for the CLS 300d automatic start from €64,805. The CLS shares much with the S-Class and has the latest touch-screen infotainment and safety/driver assistance systems. Seat backs can be folded to expand its 520-litre boot (good for golf bags). It’s worth noting the CLA and A-Class are the first Mercs, of many, to have consumption/emissions tested under the new, more realistic WLTP system.